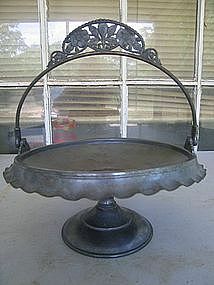 Candle holder measuring approximately 9 inches in height and base width of 4 1/8 inches. 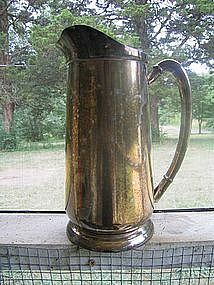 It is marked Pilgrim Silverplate B 586. 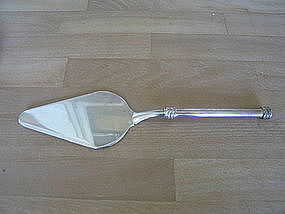 It has been used and is in an unpolished condition. There is a tiny shallow bend to the rim base, which really doesn't show, unless it is picked up and turned over. 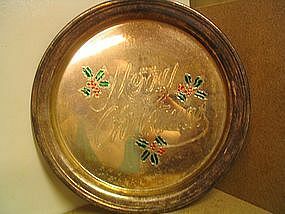 Additional condition photos by email. I need your zip code to calculate the postage. 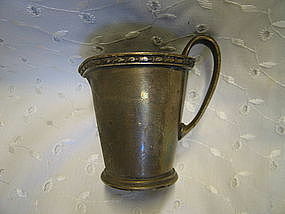 The bottom is marked as 1927 Floridan 01751 Albert Pick & Company of Bridgeport, Ind., Nickel Silver Silver Soldered 4 oz. I thought is was manufactured for the Floridian Hotel, but it is spelled different. It measures 3 3/8 inches in height. There is no structural damage, but has age related darkening to the surface. I need your zip code to calculate the postage. 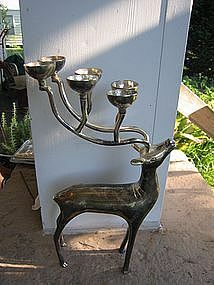 Silverplate deer manufactured by Godinger. 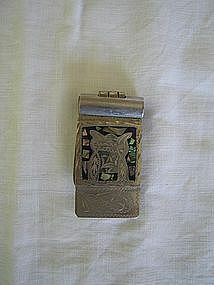 It is 11 1/2 inches in height and 7 inches in length. 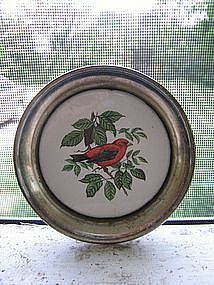 The little holders are a rounded cup shape and measure 1 inch. 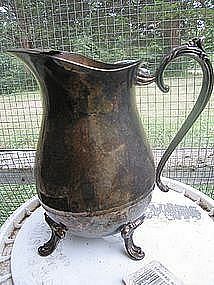 It has never been polished, but there is no damage to the finish. I need your zip code to calculate the postage. Earrings marked as 925 Mexico. 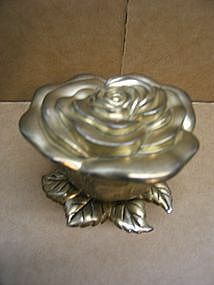 The body has a slightly convex curve and is outlined in what could either be a brass or gold wire. They measure 1 3/4 x 1 1/4 inches. 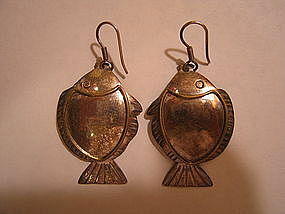 I do not know if these would be considered kissing fish. There is no damage, but I've never polished them. There is a lot of reflection and glare in the photograph, but I do have additional close-up photos by email. I need your zip code to calculate the postage. 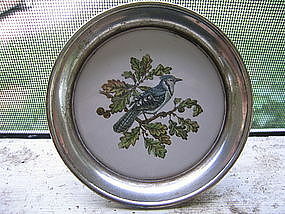 Vintage silverplate and porcelain tile coaster. I always thought it was a Yellow-Breasted Apalis, but I am not sure. 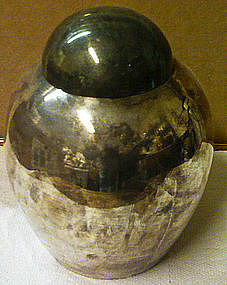 There is wear to the finish of the silver. Other coasters of the original set are available. I need your zip code to calculate the postage. 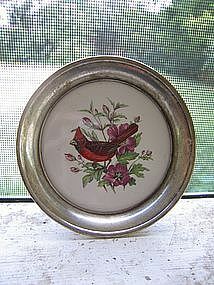 Vintage silverplate coaster with porcelain cardinal tile. 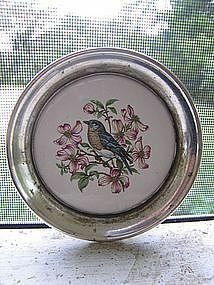 There is wear to the silver and a tiny dark fire-ed in dot to the porcelain. I have other coasters of the original set available for purchase. I need your zip code to calculate the postage. 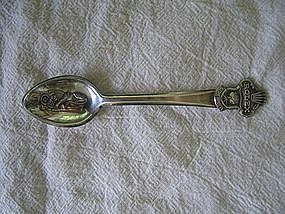 Vintage souvenir spoon measuring 4 3/4 inches in length. There is no damage. I need your zip code to calculate the postage. 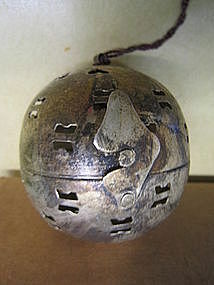 Silver 3 inch tea ball. I don't know the age. No real damage, but does need cleaning. Additional photos and info available by email. I need your zip code to calculate the postage.